I find it really bizarre that a film that the producers really didn't like, and was described by one of the writers as 'too depressing' and by the director as 'the longest student film ever made' has become a cult classic, won 2 BAFTA Awards, and has received a combined user rating of 8 on IMDB. However, I probably shouldn't consider it all that surprising since the film that we as kids voted as 'the worst film ever made' was Plan 9 From Outer Space (though that only receives a combined user rating of 4 on IMDB, and I personally have yet to even watch it - still, it is considered a cult classic, particularly since it has a combined user rating on Rotten Tomatoes of 66% with the premise that it is so bad it is actually really good). Anyway, I have already written a review (of Pink Floyd The Wall, not Plan 9 from Outer Space), though IMDB does not give me huge amounts of room to be able to really explore this film, so I will do it here. So, there are a number of things that I wish to explore in this post, first of all starting with a general overview of Pink Floyd (just in case you have not heard of them, though you can probably find everything you need to know about the band from Wikipedia), and then I will give a brief overview of the film. Then I will explore a number of themes that the film touches upon, such as war, alienation, the education system, the post-war society, relationships, and the music industry. I will then finish off exploring the allusion of 'the wall' and what I understand it to mean. However, if you haven't yet seen the movies, it is available on Youtube (though if that link is not available it means that it has been taken down due to copyright violations, so the paid version can be reached here). Oh, and while you are at it, if you, like me, haven't seen Plan 9 from Outer Space, that is also available on Youtube. I must admit that Pink Floyd was one of my favourite bands as a kid, and in many ways it still is. However in my younger years I would probably have to say that it was the music from their 'classic period' that I enjoyed the most (which would be the albums from Dark Side of the Moon to A Momentary Lapse of Reason). What surprised me though was when I discovered that they have actually been around for quite along time - they formed in late 1963 though were actively playing from 1965. I had always thought that they were more of a 70s band, though that is probably because most of the albums that they were well known for were produced during the 1970s. Another thing about Pink Floyd is that their initial members were not necessarily the members that gave the band their success - in fact Syd Barrett was effectively kicked out in the late 60s, to be replaced by David Gilmore, simply because nobody was really able to work with him. 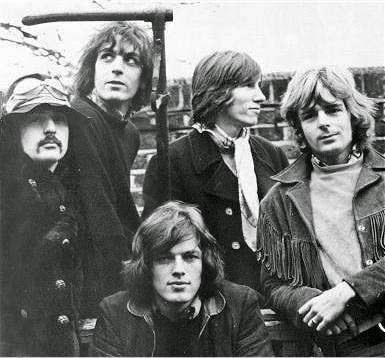 In fact is was David Gilmore, Roger Waters, Nick Mason, and Richard Wright who ended up forming the core of the band during their most successful tenure (despite the fact that Syd Barrett was still considered to be a part, even though he had been moved on). I previously mentioned Pink Floyd's classic period, that being between the albums Dark Side of the Moon and Momentary Lapse of Reason. Mind you, while I still liked A Momentary Lapse of Reason, since it was released after Roger Water's departure, I probably won't consider it a part of their classic period these days. So, you may be wondering why I call it their classic period, and the reason is that there are three periods of Pink Floyd's music - their psychedelic period (which consisted of their earlier material), their classic period (where their music style had moved away from the psychedelic to be more progressive rock), and finally their twilight period (after Roger Waters had decided to call it a day). I should mention the time that I first discovered their earlier music. It was when I was still a teenager and loved everything that was Pink Floyd, so I managed to get my hands of a copy of Atom Heart Mother, and upon listening to it my first reaction was - 'what is this rubbish!?'. It wasn't until a lot later that I began to realise that the earlier Pink Floyd albums were more akin to psychedelic rock, which is probably why they didn't hit the big time until Dark Side of the Moon. Pink Floyd The Wall is the official title of the movie (and if you simply enter The Wall into IMDB you will land up with a number of other movies, including some German Movie from 2012 called 'Die Wand'). Oh, and apparently Keanu Reeves has the nickname 'The Wall' so you will also get him popping up as well. Anyway, enough of those distractions because I was actually going to tell you what the movie is about. Once again, if you haven't actually seen the movie I would highly recommend that you go and watch it, even if it means that you have no idea what is happening (I didn't the first time I watched it, but then again I was a teenager and many of the concepts went completely over my head). So, now that you've watched it I shall now run through the synopsis (though you can also find a brief synopsis on Wikipedia, but that simply reads like an encyclopedia entry). Anyway, the movie is about a rock star called, ironically, Pink Floyd. The movie opens with him sitting staring vacantly at a television screen in a rather grotty hotel room and the maid attempts to bust in through the door (namely because she needs to clean the room and he won't open to her knocking). We then flash back to World War Two during the D-Day invasions when a bomb is dropped on a bunker killing his father. This event sets the scene of Pink's childhood as he grows up in the 1950s, where we jump through four of scenes: one being in a playground where he is wondering around alone while all the other children have their fathers; another where he is in school; another as he discovers a draw in which all of his father's belongings were kept; and one during the London Blitz, which is mostly animation, and also very surreal due to him being very young at the time (you know how some memories from your childhood seem to almost be like a dream, despite the fact you know that they were real). This whole flash back brings us up to where Pink is sitting in the room, and during this time we see him fall in love with a unnamed woman, who then walks out on him (namely because he comes across as a vacant shell that shows no emotion or love), and then the descent into madness when he discovers that his wife has left him for another man (Wikipedia suggests that he is having an affair, but in the movie it is quite clear that she has walked out on him and no doubt filed for divorce - we are in the late 70s by that time). The movie seems to jump back and forth through these periods, namely because we are not so much following a coherent story, but rather experiencing the thoughts of a man who has descended into madness. We see the beginning of this descent when he takes a groupie back to his apartment only to burst into a psychotic rage and begin smashing up everything. Once again I tend to disagree with the synopsis in Wikipedia as it is clear from this film that these groupies manage to slip into the area though the use of their sexuality (and while much of it is suggestive, it is quite clear what is going on). Okay, Pink does see her through his window, but when he opens the door, and she hands him an album to sign, that is when he realises that she is only interested in his fame, and not in him as a human. We go back to the hotel room where the door is being broken down by his production team, namely because he is supposed to be on stage, however when they find him sitting almost in a trance they then attempt to revive him, not so much to save his life (or even take him to hospital) but so that he can perform. To do this (I suspect that he is under the influence of heroin) they inject him with another drug (possibly adrenalin, since that is what medicos use to bring somebody out of a heroin trance) at which point he begins to hallucinate, believing that he is some neo-Nazi leader. 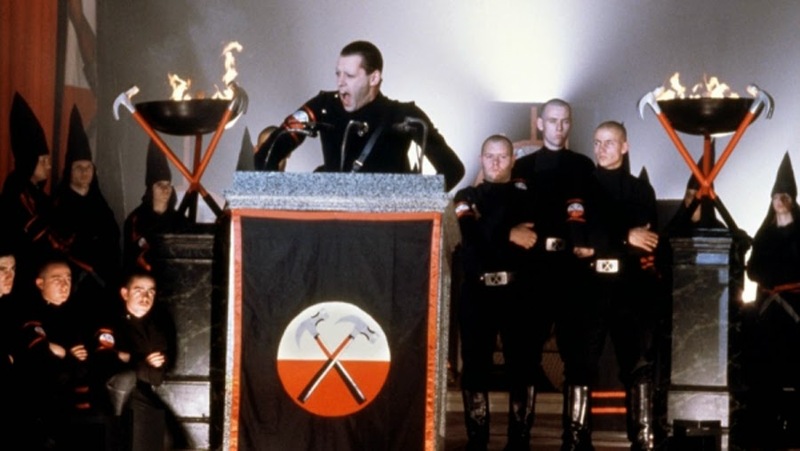 It is during this scene that we have the animated hammers - the one thing that I remember from the movie as a teenager (and while they originally designed the hammers to be a parody of the nazi movement, it turned out that some Neo-nazi group decided to adopt them as their symbol). In a way these drugs reinvigorate him and give him the feeling of power that a famous rock star has, leading his fans to stand against the social structure of the now, which ends in a riot - something that is progressively suggested throughout the film. The Wall then finishes with Pink retreating into the toilets where he is pictured as a small rag doll, being pushed and swept around by he currents of the world. In a sense, despite his fame and popularity, he feels that he is nobody and in effect powerless. He is trapped in the world with no way of deciding his own destiny and everybody else is making that choice for him. He has no identity of his one (in fact he says very little - the only thing that comes from his mouth are the lyrics of a couple of songs). Yet along with this we also have him being judged - being judged for showing feeling and being human. This is a dramatic turn from the neo-nazi riot that culminated at the end of the previous scene. Once again, this is not his decision, but it is the judgement of his peers that it is a crime for him to show feeling, a crime for him to be human - he is a rock star, and rock stars stand above and beyond human emotion. They are beings whom people look up to and follow, and they are not supposed to show their humanity. This is why he is reduced to little more than a rag doll and a puppet - ever since his school days, and even before, people have been making his choices for him, controlling him and moulding him. He is not even allowed to die in piece from a heroin overdose because, once again, he is a rock star and the adoring fans need him for inspiration, and the managers need him for the money that he generates. The movie is full of symbols. In fact there is very little in the film that is portrayed without the use of symbols. This is what I believe sets this film apart from many of the others that come out of the cookie cutter that is the modern film industry. The use of symbols, I believe, is actually very effective because unlike other films that follow the life of an individual, symbols create a much more powerful picture of the psychological torments that Pink is experiencing. In a way they paint a picture that is much deeper, and much more powerful, than the simple spoken word can even attempt. The movie is basically a musical, though not in the traditional sense. While there is very little dialogue (actually the dialogue is almost non-existent) the characters in the film are not actually singing (with the exception of the neo-nazi scene at the end where Pink is singing the lyrics of a couple of the songs). In a way the film is more like an extended video clip - in fact it is more like a video clip that encompasses the entire album (though a couple of songs, including Hey You, were dropped from the final product due to them interrupting the flow of the movie). Once again, I suspect that this is designed more to drag the audience into Pink's psychological torments, and as a cinematographic technique, which I believe that it does this really, really well. 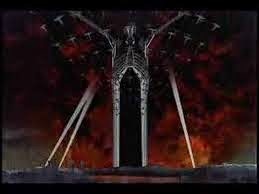 It is interesting how the picture is painted, and in many cases we seem to jump back to a familiar symbol a number of times in the movie. For instance there are the scenes where the young Pink is running on a field with a set of rugby goals in the distance. At first I considered this a sense of innocence from his childhood, but as I think about it I suspect it means something else. When considering the rest of the film the context of innocence in his childhood was non-existent. Pink grew up without a father - in fact he never knew his father - so there was never a time when his childhood could be considered innocent. Also, noting that when he was a baby during the blitz - he had no idea or understanding of what was happening or why (though no doubt this would become clearer as he grew up, which is probably why he had the hallucination - though according to one website, it is his popularity as a rockstar that sends him down this Hitleresque path). To me this symbol represents the ever fleeting goal and lack of purpose in his life. In a way he never had a goal, and even if his goal was to become an artist (which he achieved), by reaching this stage he realised that he had never become fulfilled. This is why the goal is so far away, and why he at times runs towards it but at other times is running away from it. The goal that he seeks, in many cases, is unobtainable, and at times, while he moves towards it, in reality he is moving away and in a sense it is unreachable. In fact I suspect that he does not even know himself what he desires and what he wishes to achieve. Anyway, I will leave the symbolism at that and instead move towards the themes of the movie which stand out to me. Okay, maybe I am seeing things differently to what the artists originally intended, and my interpretation is not necessarily the only interpretation. However I wish to explore these ideas anyway. For those who are interested, a much of indepth and detail analysis of the album (and the movie) can be found at The Wall Analysis. Also, you will see similar themes arising from other albums during Pink Floyd's classical period. Before I continue, I will mention that each of these sections explore some themes that I saw in the movie. However, instead of using boring titles, I will refer to the names of some of their songs which I feel captures the idea of the theme. However, the song itself may not necessarily be touching the theme that I am talking about - for instance, Welcome to the Machine has more to do with the music industry being little more than a money making machine as opposed to a criticism of the modern educational system. Anyway, the first thing that we confront in Pink Floyd The Wall is the horror of war. I don't necessarily believe that it is an anti-war movie, because I do not believe that they were suggesting that we should have simply laid down our arms and let the Nazis conquer the world. Despite that war does come at a price: it disrupts families and it creates a lasting psychological impact upon people. Pink's father was killed during World War II when a bomb struck the bunker that he was in, and this had a profound impact upon his life. Pink grew up without a father, in a single parent household where everybody around him appeared to have a 'normal' nuclear family. The suggestion, especially since this is revealed right at the beginning of the film, is that the lack of a father determined his direction in life, and his inability to be able to connect with people. The other effect is the psychological impact of the blitz. Sure, it is suggested that at the time of the blitz he was a baby, but it is also suggested that the event still haunted him throughout his life. 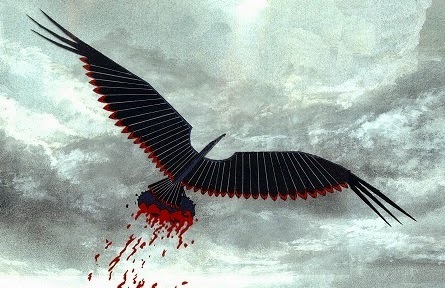 The animated scene at the beginning where we have a nazi eagle flying around the sky and ripping chunks of flesh from the ground paints a picture of the impact that this had on him. This is suggestive that even as a child, especially a young child, disturbing events can still impress themselves into our mind and have life long psychological effects. In may respects we live alone in this world. While we may have friends and family nobody can truly know what it means to be who we are - we are all islands adrift in a sea of unknowing. We all handle this alienation differently - some of us accept it and live life as best as we can, while others of us retreat even further into ourselves, knowing that nobody can truly know who we really are and the pain that we are suffering. There is no indication in the film that Pink's mother did not love or cherish him, however we still see that in many cases Pink has grown up alone. This comes out very clearly in the playground scene where his mother leaves him to play while she goes out and does her shopping. I doubt that there was any callousness behind this - she most likely believed that Pink would be happier playing with the children rather than following her around doing the groceries. However this is clearly not the case (and goes to show how even those who are closest to us can never truly understand who we are). We see Pink wondering alone around the playground - all of the other children are playing - are happy - yet Pink is alone. It is clear that what he is missing is a father, and when he tries to go and interpose himself on a father figure his is promptly rejected - this father already has a son to love and cherish, he does not want another one. It is not that he does not understand, he simply does not care. Pink is not his child, and he sees no reason, nor has any desire, to show him any affection. This no doubt has a significant impact upon Pink's adult life. In many ways our experience as a child determines our personality as an adult, and during his formative years all Pink experienced was loneliness and alienation. We see this further when his finds a small mammal (I believe it is a rat) and takes it home as a companion, but his mother wants nothing to do with it. Instead he takes it down to a shed where he puts it in a nest, only to discover the next day that it has died. Every attempt at friendship meets with failure during his childhood, which goes a long way to explaining why at the beginning of the film he is sitting alone in a flat staring blankly at the television screen. Pink's time at school opens with him sitting in class writing poetry when his teacher comes up, reads the poem out in class, mocks and ridicules him, and the goes back to teaching. As it happens, the poem that Pink is writing is the song Money (which catapulted Pink Floyd to international fame). For quite a while I believed that Another Brick in the Wall Part 2 (the famous one that I grew up on), and it screaming out 'we don't need no education' was simply the cry of a teenager frustrated at having to spend his time in school when he (or she) could be doing other things. I even remember us all singing that song as we danced out of school on the last day of term. Yet while the line may say 'we don't need no education', many of us fail to realise the imperative of the next line: we don't need no thought control. This is when I understood what the song was about (and watching the idea painted on the screen' also helped): it is not a song denouncing education or decrying the uselessness of it, but rather the nature of the modern educational system. As I was watching this part of this film I was reminded of something that the philosopher Michael Foucalt once said (though unfortunately I am unable to quote the source): the modern education system is modelled on the modern penal system - the school is very much like a gaol. In another sense the modern school is very much like a factory where the children go in one end as individuals and come out the other end as clones that have been transformed to exist in the modern society. The school is a factory - in fact it is an assembly line. Each stage of our schooling is designed to teach us certain things, and the children go from class to class, all being taught the same and all being expected to act the same. This is why Pink dreams of the students rebelling and throwing the headmaster onto a bonfire. It is not so much an attack against education in general, but rather the industrialisation of education where all free thought and individuality is forced out of us and we end up becoming clones (or even worse, thrown into a grinder where our individuality is destroyed and we are combined into the paste that is modern society). Pink is not mocked by the teacher because he is writing poetry in class, he is mocked and ridiculed because he is breaking the mould and showing individuality, thus appearing like the reject on the assembly line that must be taken off and put on back at the beginning so that it might come out the way it is supposed to come out. The picture to the right may seem to little more than a picture of two flowers, but those two flowers, dancing around each other, begin to make regular appearances in the film. 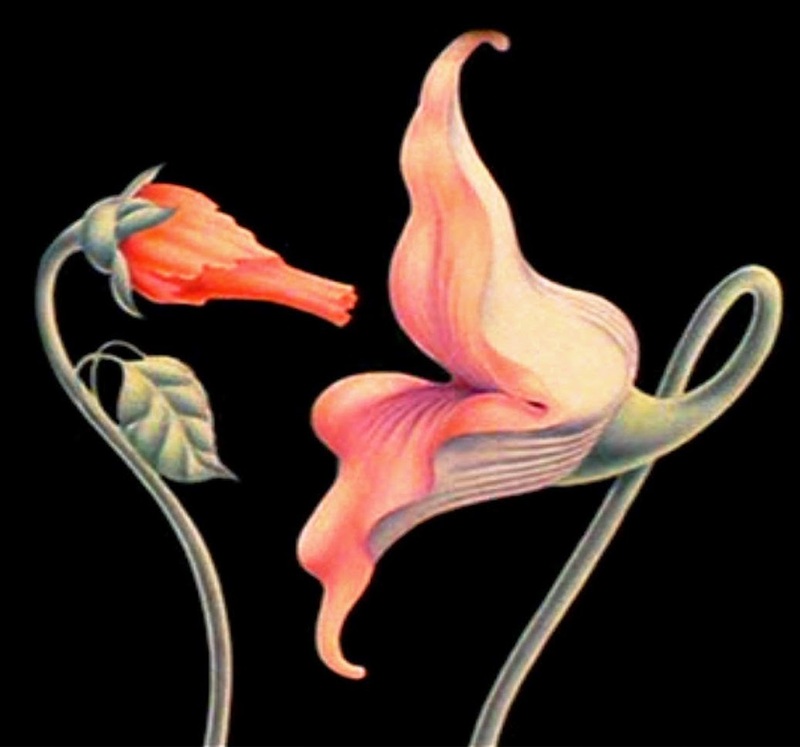 The animated dancing, where the long flower moves towards the larger flower, and then recoils in terror is painting a powerful picture of Pink's inability to be able to form an intimate relationship. We know that Pink meets a woman during a nuclear disarmament meeting, and we know that they marry. However when they are married we discover that Pink has become cold, not heartless, just cold, and she ends up walking out into the arms of another man. What is difficult to show in a live action sequence is brought to life through the use of animation. Pink finds it difficult to, and in fact fears, intimate relationships. We see this at the dance, which is an allusion as opposed to an actual event, as he is a child who approaches an adult woman and asks her to dance with him. This picture shows us that when it comes to relationships, especially intimate relationships, Pink is still a child. He simply does not understand relationships, and cannot embrace the love of another woman. This is also shown when he takes the groupie up to his room and then has a violent fit. He simply cannot handle intimate relationships. While one might be tempted to blame everything on the fact that Pink grew up without a father, we must remember that this is what the film is actually trying to demonstrate. His inability to love and to be intimate is a direct consequence of his alienation as a child and that he did not have a father. However, as the dancing between the flowers continues one of the flowers becomes monstrous (the feminine flower) and attacks him. This is where she walks out, and this furthers impact him in that love hurts, and love is painful. Not only did he grow up without a father, but his wife has now walked out on him adding further fear of intimate relationships (which is why he smashes up the room while the groupie is cowering under the table). The post world war two era was supposed to usher in time of peace and great prosperity, and for a while it did. The Fifties are looked back by the people who lived through them with great fondness - however this was not to last. I guess it has a lot to do with the final words of President Eisenhower: beware the military-industrial complex. Yes, for the baby boomers it was an era of prosperity, but somewhere it all went wrong. Vietnam, the Cold War, and the ever present threat of nuclear annihilation seem to put paid to the idea of lasting peace, and the prosperity that we dreamed of has lead to a technological hell were we are all enslaved to the industrial machine. Pink Floyd questions the post-war dream in The Final Cut, though it is more of a reaction against Thatcher's decision to go to war in the Falklands. However, as I watched this film all I could think of was the technological nightmare that the world had become after World War II. Winning the war was supposed to make the world a better place for the children of those who fought, and died. However this world has turned, at least for Pink, into a living hell. Granted, he is a rock star, but he lives in a perpetual hell with a psychological wall separating him from the rest of the world. For a very popular progressive rock band, Pink Floyd is incredibly critical of the music industry. In fact the theme of the album Wish You Were Here is the modern nature of the music industry and how bands simply exist to make money for the producers. The modern music industry is less about art and more about profit (and it is clear that a progressive rock band is not interested in writing songs that people already like but rather to explore different music styles). Art is about experimentation, about creation, but this conflicts with the ideas of the industry who are only interested in the tried and true, because the tried and true is what the masses like, and in turn what the masses buy, thus generating profit. Experimental music has a tendency of flopping, and the producers do not like flops because it eats into their profits. 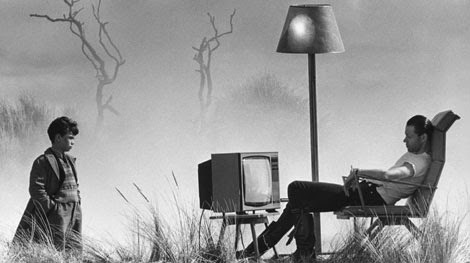 However we see another aspect in Pink Floyd The Wall. Pink is in his room, cut off from the world, but he is supposed to be on stage, and if he does not appear on stage then the producers are in trouble because people paid money to see him, and if he does not appear then no doubt they are going to want their money back. They don't care about Pink, they only care about his music, which is why they inject him with drugs and throw him back onto the stage. This is where the neo-nazi rally begins, and is another warning. Rock stars, especially popular rock stars, have an enormous influence on their fan base. This is why he has the hallucination that he is a neo-nazi leader leading followers out of the concert hall and into the streets of London where they begin to riot. I have even seen this in real life where, after an Ice-T concert, all of the fans stormed out of the concert hall and began trashing everything in sight. So, the question, after all of this is: what is the wall? Well, you probably know this anyway, especially if you have read some of the commentaries on the album, but it effectively is the mental barrier that prevents us (or at least Pink) from being able to relate to the outside world. Through out the movie events in his life act to build this psychological wall ever higher: the death of his father; growing up without a father; the modern education system; his failed relationship; and finally the machine that is the music industry. As these events impact him psychologically the wall gets higher and higher, and he becomes more and more alienated. In the end he is nothing more than a rag doll cowering in a toilet cubical while being judged for committing the crime of showing emotion and feeling. Does he break out of this wall? No, he doesn't, he just retreats further and further into isolation. The film does not end with him being free, but rather as a cowering mess. Instead the film ends with a group of children picking around the rubble in the aftermath of a riot, and one of them picks up an unused molotov cocktail, looks at it, and then empties in on the ground. Thus the cycle of alienation begins again. Pink Floyd The Wall - The Alienation of Success by David Sarkies is licensed under a Creative Commons Attribution-NonCommercial-ShareAlike 4.0 International License. This license only applies to the text and any image that is within the public domain. Any images that are the subject of copyright are not covered by this license. Use of these images are for illustrative purposes only are are not intended to assert ownership. All images on this post are © and/or ™ their relevant owners. If you are the owner of any of the images used on this website and wish them to be removed then please contact me. If you wish to use the creative commons part for commercial purposes, please contact me directly. Pink Floyd Members: Source Wikipedia, used under the fair use provisions of the laws of the United States of America.